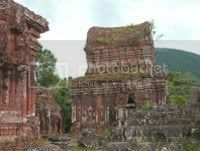 Remnants of the Vietnam-US war in the form of bombs and mines are still being unearthed in the vicinity of the My Son Sanctuary, a Champa religious complex in Vietnam. We often hear about efforts to defuse mines in Cambodia and the Angkor ruins (in fact, I remember watching a National Geographic documentary about it once), but we often overlook other former trouble spots like Vietnam. Soldiers unearthed several different kinds of bombs and mines in this area, including fragmentation grenades, mortars, mines, and various primers. UNESCO Vietnam on January 8 organized a training course on detecting and destroying bombs and mines in My Son, with the participation of many experts and UNESCO representatives in Southeast Asia. Bombs and mines still pose an occasional threat to the visitor to My Son, but by and large, the temples were left largely unscathed during the time of the war. UXO or unexploded ordance is a big problem in this part of the world. I’ve just returned from a caving expedition to NE Laos, Vieng Xay area, which was heavily bombed constantly for 9 years during the Secret War. There is UXO everywhere, and everyday the demining teams are in action. We found bombhead and bombs in caves. Needless to say we had to get special permission to hold our expedition.